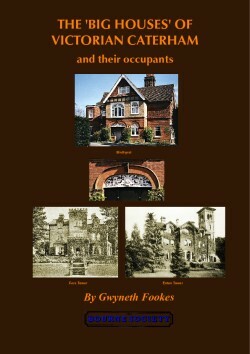 This book by Gwyneth Fookes (published in May 2011), is the culmination of many years of research into the ‘Big Houses’ of Victorian Caterham: nominally those that employed one or more servants. Comprehensively illustrated, with photographs, plans, maps and drawings, this book gives a fascinating insight into the development of Caterham over the decades. A4, 215 pp, illustrated. Published May 2011. ISBN 978-0-900992-70-4. Price £12.00 [add £2.50 p&p]. This very popular book was reprinted in 2016. Description – The Court was built long before the Victorian period, but its details through the period are of interest. Its early days are to be found in Bourne Society Local History Records No.3, pp.4-12 by Jeoffry Spence. 1861 Census – Frederick Cayley-Worsley, 50, coal miner & funded property, farming; Julia, his wife, 40; 7 daughters, 4 sons, governess and 6 servants. 1861/2 Directory – F C Worsley, Court Lodge. 1865 Rateable Value – £153.0.0d and land £170.0.0d; owner/occupier F Harrison. 1869 Rateable Value – land £170.0.0d; owner/occupier Wilkins. 1866/7 Directory – J Fortescue, The Court. 1871 Census – William D Bentley, 31, member of the Stock Exchange; Frances his wife, 5 children and 5 servants. 1872/3 Directory – W D Bentley. 1874 Directory – Robert H Salmon, The Court. 1881 Census – Robert H Salmon, 55, wholesale tea dealer; Martha, 55, his wife; 3 children & 7 servants. Lodge – ? and family. Stables – 2 grooms. Lodge – coachman. Lodge – head & 2 servants. 1889 Rateable Value – £220; owner J Wilkins, occupier R H Salmon. 1899 Directory – Robert H Salmon, The Court. 1891 Census – servant in charge. 2 grandchildren and 6 servants. Coachman’s cottage – gardener. Cottage – coachman. Cottage – coachman. 1901 Rateable Value – £255; owner James Wilkins, occupier Robert Salmon. 1908 Directory – W J Randles. 1926/7 & 1937 Directory – not listed. The plan of the Court House, as the author knew it until about eight years of age, was untidy and rambling, but even to this day the delightful nostalgic odour of years of decay and rotting vegetation can still be recalled with considerable pleasure. To the left of the front door was the enormous dining-room, where the floor had given way and a good deal of the decorated ceiling had collapsed. To the right was the drawing-room, all blue and gilt, with doors leading to a big conservatory, most of which had disappeared. Behind the drawing-room lay the oak-panelled library, a comparatively small room. To the left, behind the dining-room, was a central corridor which led through a swing-door (covered with green baize) into the various kitchen and staff quarters. Most of the bedrooms upstairs were in good condition, except for peeling wallpaper (hideous in Victorian designs, and mostly of sombre colours). The roof over the western portion of the house had largely given way and the rains of many years had made the floors dangerous. The solitary bathroom was fascinating: there being no proper roof, the bath would fill with water, and after every storm, a visit would be made to remove the antiquated metal plug for the sheer delight of hearing the water splashing through into the kitchen below, the plumbing (such as it was) having disappeared long since. There was a flat roof on top of the older portion, very useful when one wished to absent oneself from authority, although it meant climbing up the roof 40 feet above the ground, a feat which, for some reason, grown-ups were unwilling to emulate. When the author first knew the house there were quite a lot of windows which still had the glass intact. This state of affairs did not last very long. The gardens were, of course, completely wild, but behind the house there were still rows of comparatively trim box hedges, and amongst the banks to the front of the house, covered with dark and extremely grubby yew trees, were the remains of a fountain. John Wilkins died in 1901 and the 72 acres was offered for sale as freehold building land, fronting Stanstead Road, Willey Road, and Roffes Lane by Fuller, Moon & Fuller. When I was quite a small girl, one of the most exciting things my friends and I did was explore Caterham Court. The old house, then almost a ruin and then surrounded closely by trees. Most of its main rooms faced south, on which side of the house there was an ornamental white porch. I can remember a large drawing room with faded wallpaper and ornamental frieze; it had an air of former splendour with its large shuttered windows, though the ceiling was falling in. The grand staircase in the centre of the house had many stairs missing and it was only when feeling very adventurous we dared go up. The gardens had been beautifully laid out. There was a part near the house still in quite good condition, where beds were surrounded by small box hedges, reminding one of Elizabethan days and flowers continued to appear in the undergrowth. We spent many hours in the nuttery. The orchards were, of course, full of gnarled old trees.